Provenance: Donated to The Royal London Hospital Archives & Museum by the Belgian government and people, September 2000. 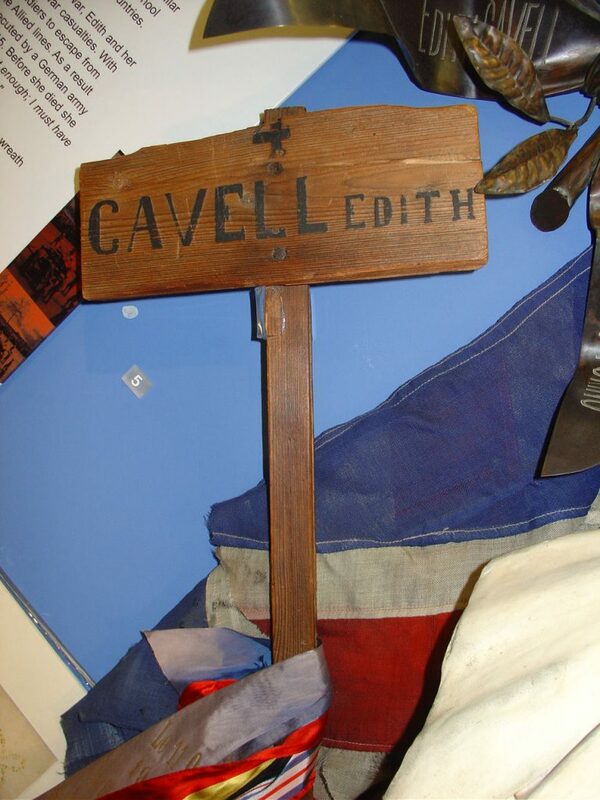 Previous history: Caption (in French) states that the cross was latterly exhibited at the canteen, Tir Nationale and donated to the Institute Edith Cavell – Marie Depage in 1952 by the canteen proprietor, Mme. Ringoet. The original cross put up on her grave site at the Tir Nationale in 1915 was a simple cross with a simple number (5, according to a contemporary postcard, which is I think the image you attached before). The cross of which you have a remnant was, as I understand it, put up on her grave site after the liberation of Brussels in 1918. It apparently became a target for souvenir hunters. Information courtesy of Richard Meunier, Deputy Archivist/Curator. Photograph courtesy of Royal London Hospital Archives & Museum.